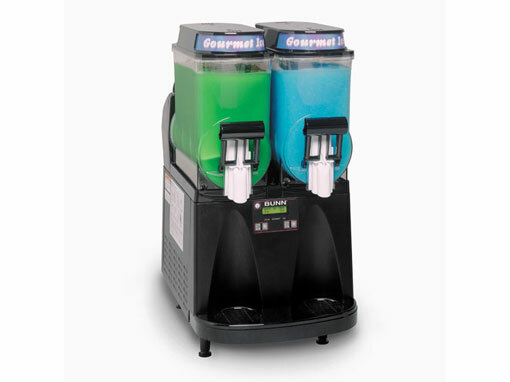 Slushie machine rentals for events of 50 – 5,000 guests – we bring the slushies to you! Work, kids or community events. Staff, delivery & set up available. All package prices are determined after speaking to you about your event. Contact us today! A crowd pleaser! We drop off and set up Bunn Ultra 2 machine and premium mix, and iced or slushed mocktails and cocktails are ready before you know it! Ideal for home or office parties. Be the coolest parents ever! We drop off and set up Ugolini machine and Slush Puppie mix and your kids will be drinking slushies in no time. Great for birthdays, end of year school parties. Better than handing out pens! Serve slushies in your corporate colour and bring traffic to your business or display booth. Attract the kids and the adults will follow. Branded cups available. Do you need a signature drink for your special event, gala or wedding? We can provide iced or frozen slush to match your theme. We provide the slush and recipes; bartender adds the alcohol. Great for large scale community events! Our personable staff can serve slushies in your business or organization’s colours, freeing up your team’s time for networking. We do more than slushie machine rentals! Perfect for pairing with your margaritas, we offer a range of authentic Mexican décor for rent in Vancouver including serape table runners and blankets, huichole beaded centerpieces, Mexican tin stars, puppets and cactus buffet décor. All décor items are priced individually on our rental pricing list, but can also be rented as part of small, medium and large packages at considerable savings. Our clients include Rainmaker Entertainment, Electronic Arts, BMO, Rethink Communications, Whistler BBQ Championships, Air Canada, Whitehall Agencies, Molson Canada, Terminal City Club, Brock House, Cossette Communications, Collingwood School, Air Canada. Speak to us, confirm event type and date, flavours, deposits etc. We Bring Slushies to You! We get quite a few questions regularly, so we will try to answer some of those here! Do you just rent slushie machines or do you also do party planning and catering? We don’t do catering (our private chef moved back to Mexico) but we provide the only “concierge” frozen drink machine rentals for parties and events in the Lower Mainland. We do work with some great caterers that we can recommend and can provide delivery from restaurant wholesalers of the best guacamole, salsa and tortilla chips. We do have Mexican decor and service ware available for rent. We can also offer general event planning advice as part of our service. Contact us for more information. What slushie flavours and colours do you have? We have over forty flavours, including the most popular for adults (lime, strawberry and peach) and the most popular for kids (blue raspberry, cherry and orange). We also have a variety of “iced cap” flavours. You can pick your flavour to match the colour theme for your event or corporate logo, such as: white, yellow, orange, pink, red, aqua, royal blue, purple and near black. See list of flavours. Contact us for more information. Our Bunn Ultra 2 frozen drink machines are rated for alcohol and we can provide you with information on the quantities of alcohol you would need to make a variety of frozen cocktails. Add one ounce of hard alcohol to every seven to eight ounces of slush. We are not licensed or insured as a bartending service but we can recommend bartenders or servers with Serve it Right if required. Please make sure that your event has the proper licensing required if you are serving or selling alcoholic beverages. See the FAQ page for more! Find many more event and slushie-related answers on our Frequently Asked Questions page. We have hosted our daughter’s softball wrap up parties for many years and have used Cabo Enterprises every time. The slushies are big hit and are what the girls and even the grown ups, look forward to every year! Delivery and pick up is always seamless and the machines always look brand new. When Cabo Enterprises looked after supplying blue slushies as a giveaway for our client’s event at a local university, I was blown away with the level of service we received. The quantity of product required had increased at the last minute, but Catherine took it in stride and made it happen. Running events are not always smooth, and Catherine went out of her way, over and above expectations to ensure the event was a success, and helped improve the impact of our message. I would definitely recommend Cabo Enterprises as a frozen drink supplier.